Researchers: S. Symithe, Purdue University; E. Calais, Ecole Normale Supérieure, Department of Geosciences, PSL Research University; J. B. de Chabalier, Institut de Physique du Globe; and R. Robertson, and M. Higgins, University of the West Indies. A plate tectonic model for the Caribbean is derived using most of the available continuous and campaign GPS measurements in the region. The model of present-day motion depicted by the rotation of smaller rigid blocks along locked or partially locked faults shows the rate at which active faults in the Caribbean accumulate strain, an important quantity for seismic hazard assessment. Analysis shows the subduction edge of the Caribbean plate transitions from fully locked near Hispaniola to partially locked under Puerto Rico and the Lesser Antilles. This behavior implies about one magnitude 8 earthquake every 2000 years along the subduction zone. The Caribbean plate is a relatively small plate bounded by the North American, South American, and Cocos plates, moving about 2 centimeters per year to the east with respect to North America. This relative motion is accommodated by two nearly parallel east-west-striking strike-slip fault systems along the northern and southern edges of the plate, and by the subduction of the North American plate along its eastern edge. Determining plate boundary kinematics and deformation in the Caribbean has been difficult because most of the region is under water. Over time, more and more GPS sites have been installed on the many island nations in the Caribbean and throughout the bordering areas of North, Central and South America. 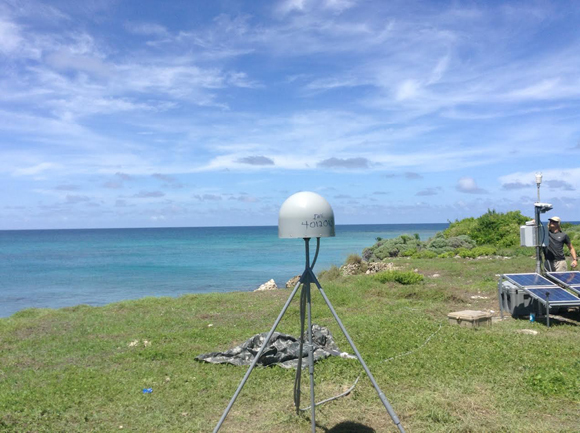 After the 2010 Mw 7.0 Haiti earthquake, the U.S. National Science Foundation supported the development of COCONet, a network of geodetic/meteorologic sites throughout the circum-Caribbean to better understand the tectonics and the atmospheric dynamics of this complex region. The authors processed data from 342 GPS sites to yield a set of coordinates and velocities expressed in the International Terrestrial Reference Frame 2008 to quantify the regional kinematics. The resulting GPS velocities are modeled as a series of rigid blocks separated by locked or partially locked faults. 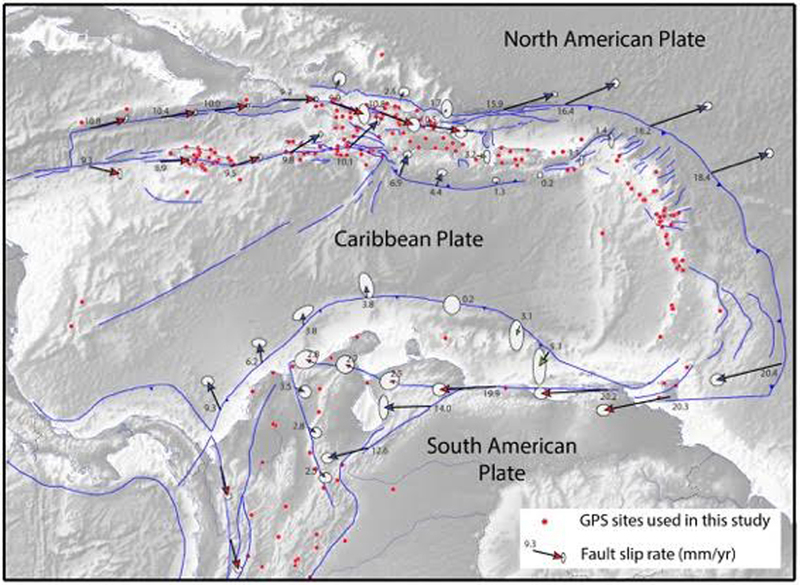 GPS velocities derived from this work provide refined slip rates on the strike-slip faults systems bounding the Caribbean plate to the north and south. 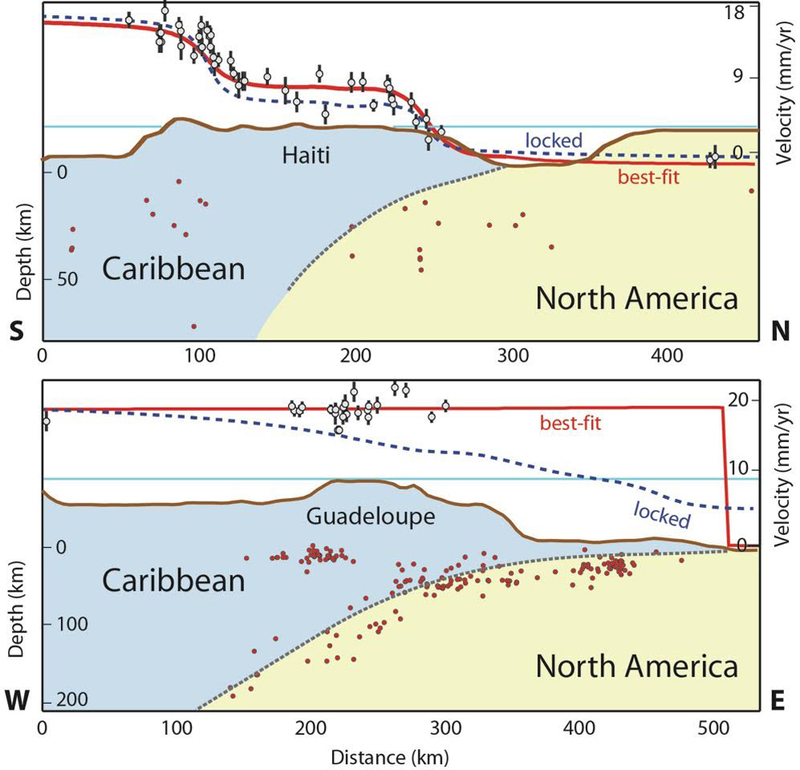 The much-improved GPS velocity field in the Lesser Antilles excludes more than 3 millimeters per year of strain accumulation on the Lesser Antilles-Puerto Rico subduction plate interface, which appears essentially uncoupled. This behavior is consistent with at most one magnitude 8 earthquake every 2000 years in this region, where most large magnitude events have occurred on normal faults off the plate interface. Symithe, S., E. Calais, J. B. de Chabalier, R. Robertson, and M. Higgins (2015), Current block motions and strain accumulation on active faults in the Caribbean, J. Geophys. Res. Solid Earth, 120, doi:10.1002/2014JB011779.